Prehistoric peoples who used bluff shelters sometimes used the walls of the shelter as a “canvas” on which to create art. The term “rock art” refers to images rendered on natural rock surfaces, such as bluff faces, cave walls, and large boulders. There are two main kinds of rock art found in Arkansas Ozark bluff shelters—pictographs and petroglyphs. Pictographs are paintings done on the surface of the rock. The pigments used in Arkansas are usually red or black. Black can be made from the mineral manganese and red is made from the mineral hematite. Evidence for hematite being mined from the bluff face can be seen at some shelters, such as Craddock in Crawford County. When powdered these pigments can be combined with a binding agent like animal fat to make a paint. 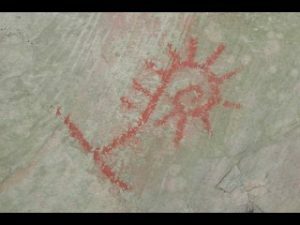 To create pictographs, the artists applied the paint directly to the rock, either with some sort of brush or with their fingers. Pictograph made with hematite-based paint from Brown Bluff in the Boston Mountains. Petroglyphs are made by pecking or abrading the rock in some way to draw a shape. Tools that look like abraded or worn stones, similar to the hammer stones used for making chipped stone tools like arrowheads, have been found in some bluff shelters—for example, at The Narrows—where petroglyphs exist. These have been interpreted by Jerry Hilliard as part of the “tool kit” for making rock art. Some petroglyphs, called “painted petroglyphs,” also have pigment applied after the image is pecked into the rock. Dr. George Sabo, now the Director of the Arkansas Archeological Survey, has led an extensive research program examining rock art in Arkansas. This collaborative project systematically recorded rock art in the state and also examined regional styles of rock art, which may represent cultural boundaries. 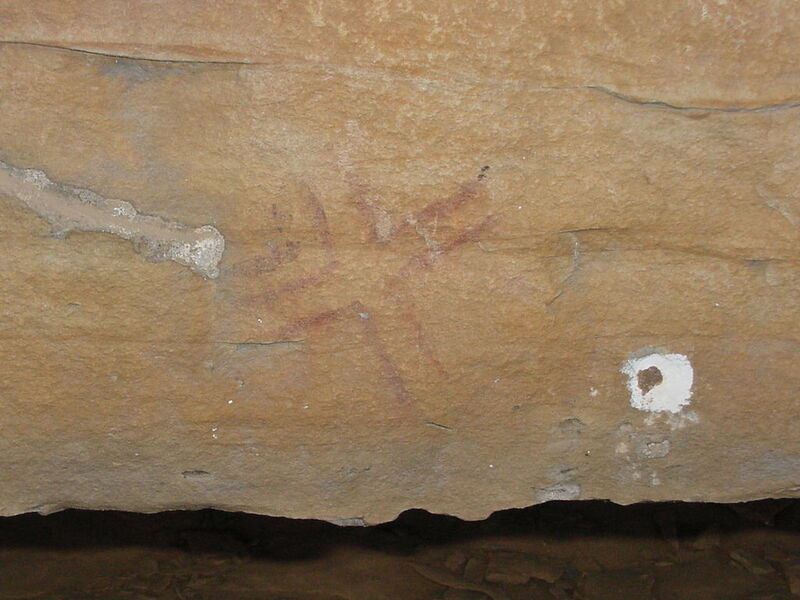 Some rock art depicts naturalistic images from everyday life, like this pictograph of a fiddlehead fern from Peitit Jean Mountain or the paddlefish and fish trap pictographs from Rock House Cave. Other examples are more abstract or geometric, such as the cross depicted above. Still other examples, especially north of the Arkansas River and in small, isolated shelters, have been interpreted as connected to the prehistoric ritual life of Native Americans. Dr. Sabo’s interpretation of the human figures at The Narrows as a depiction of a dance honoring a Native American creation myth is one such example. This makes bluff shelters sacred places to many modern tribes. 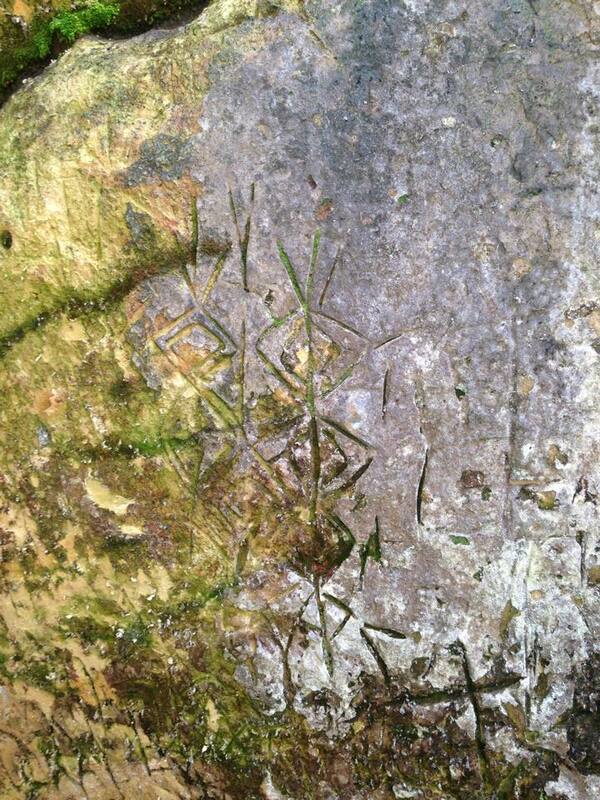 Petroglyph pecked into the rock from Edgemont in Fairfield Bay, Arkansas. If you are interested in learning more about rock art in Arkansas, the results of Sabo’s multi-year, grant-funded program to record rock art across the state and interpret it for the public can be found in Arkansas Archeological Survey’s Popular Series publication Rock Art in Arkansas. This book, edited by George and Deborah Sabo, can be purchased from the Arkansas Archeological Survey’s Publications Program. Additionally, for more information you can check out the Arkansas Archeological Survey’s Rock Art in Arkansas website. There are two bluff shelters you can visit that both contain rock art: Rock House Cave in Petit Jean State Park and Edgemont Shelter in Fairfield Bay. The shelter in Petit Jean state Park has many examples of pictographs while the Edgemont Shelter has some impressive examples of petroglyphs.